The 2018 Reebok CrossFit Games Regional format is going to look a bit different than in recent years. Months ago, Director of the Games Dave Castro hinted that there would be changes, and he expanded on the changes during the Cool Down Show at the 2017 Reebok CrossFit Invitational. We are expanding the number of Regional competitions from eight to nine. We are bringing back the Latin America and Europe Regionals, and consolidating down to five U.S. Regionals. Californians will now compete at the West Regional. European athletes will be divided between the Europe Regional (Central + North) and the Meridian Regional (South Europe + Africa Middle East). These changes result in a more balanced distribution of Regional spots based on the growth in participation worldwide. The number of spots to the Games will still be 40 men, 40 women and 40 teams. The North American, European and Australasian Regionals will each send their top 5 from each division. 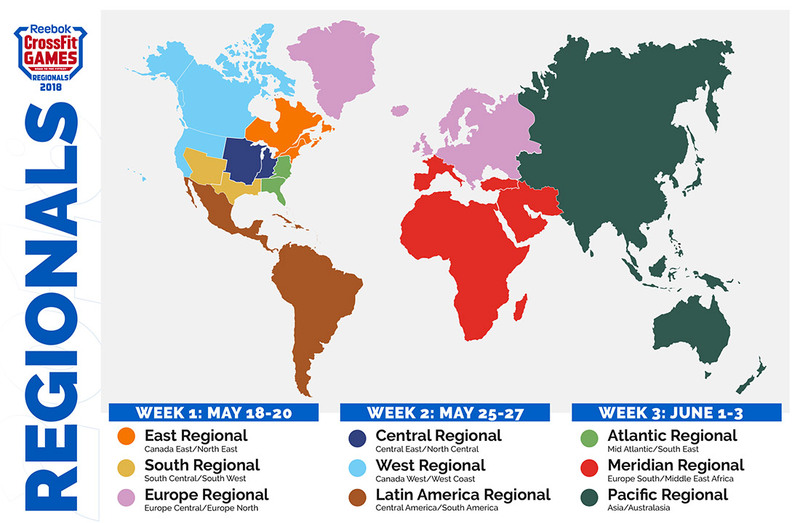 The Meridian Regional will send four and Latin America will send one from each division. "In 2015, we made the decision to move from 17 qualifying events to eight," said General Manager of the Games Justin Bergh. "The level of excitement and competition stepped up, and the change also resulted in a more competitive field at the Games. Since then, Europe has consistently performed well at all stages of the season and earned additional spots. Latin America has become a huge part of the Open, and proven they deserve their own event and to send a representative to Madison." In the team competition, teams will consist of four members instead of six. Russia falls into Europe North and Asia, split along the Ural Mountains. South Central will include Texas through Mississippi and will only include U.S. States. West Coast will include California as well as the North West states from Washington to Wyoming. Alaska and Hawaii are also included. Central America will include Mexico through Panama and the islands to the east. Europe North will include Aland Islands, Bulgaria, Belarus, Bouvet Island, Czech Republic, Denmark, Estonia, Finland, Faroe Islands, Greenland, Hungary, Iceland, Lithuania, Latvia, Norway, Poland, Romania, Svalbard and Jan Mayen, Slovakia, Sweden and Ukraine. Europe Central will encompass Albania, Austria, Belgium, Bosnia and Herzegovina, Germany, United Kingdom, Greece, Croatia, Isle of Man, Ireland, Liechtenstein, Luxembourg, Moldova, Macedonia, Netherlands, Serbia, Slovenia and Kosovo. Europe South will include Andorra, Switzerland, Cyprus, Spain, France, Guernsey, Gibraltar, Italy, Jersey, Monaco, Malta, Montenegro, Portugal, San Marino, Turkey and Holy See (Vatican).